While New Year is celebrated almost everywhere around the globe in common ways like having parties, lighting fireworks, gather with friends and family, you can always choose to experience something different and involve culture from a foreign place to spice up the change of year. One of the best choices for this matter is to have your New Year in Russia. Why? Because during this time of the year they hold special festivities through the Winter Festival. The event lasts from December 25 until January 9. Seeing the span of the festival which is quite long, you can tell that the event celebrates not only New Year, but also Christmas and the Orthodox New Year which happens in January according to their calendar. In Russia, though, the celebration of the change of year surpasses the feast of Christmas. This is why the Winter Festival is the the best way to have memorable New Year events. This city always becomes the center of the Winter Festival. New Year is celebrated merrily here and the fact that snow blankets the whole place makes it just right to be called Winter Wonderland. A spread of white layer of snow on beautiful parks and landmarks make them look like they come right out of postcards. A lot of things happen in Moscow during the New Year celebration. One that you cannot miss is the fireworks show. It is must to see on the early hours of January 1st around the Red Square, Kremlin, and St. Basil Cathedral. The show usually lasts for thirty minutes from 3 to 3.30 in the morning. The best spot to enjoy and take pictures of the show is from Patriarschy Bridge. The place is easy to reach by metro and you don’t have to worry about transportations during the New Year because they operate until early in the morning. Parks all over the city also offer festivities and attractions for everyone. There is the largest skating rink in Gorky Park where light shows, music concerts and cultural events also take place during the Winter Festival. Sokolniki Park, a bit far from the city center, offers a more relaxed ambience since it is closer to nature. You can go snowboarding here or try the uni-cycle and trampoline. There’s also an open-air cinema and stages for music concert on New Year’s Eve. If you want to understand Russian culture and history better, then Tverskaya Ulitsa and The Muzeon Park are the right spots. You can find theatres, museums, and historical places around these two places. The street is beautifully decorated with lights, Christmas trees, and even a tunnel of lamps. Of course they are open along the year too, but there is always something special during the celebration of New Year here like fireworks show and folk dance shows. Never worry about your tummy during the Winter Festival, because food stalls are spread all over the parks and venues. Light meals, snacks, and drinks are easy to find. You can enjoy bagels with strawberry and honey jams or hot pancakes accompanied by a glass of authentic vodka. Hot coffee and tea are everywhere. Traditional snacks stalls are ready if you want to try local taste but not up for heavy dishes yet. They are undoubtedly delicious and won’t be too difficult for foreign tongues. However, thinking of how special New Year is, you should try Russian fine dining and enjoy their famous local foods too. Some dishes are even only served during the Winter Festival to welcome the new year like caviar, baked duck, pickled tomatoes, olivier salad, and – something that similar to Chinese New Year – Tangerines. There are also some Russian soups you should try especially when it gets too cold in December and January. To enjoy these dishes, you can find famous restaurants and cafes around the city that open until very early in the morning on the New Year’s Eve for celebration. If you come to Russia, Moscow in particular, during the Winter Festival, you surely don’t want to miss the most stunning view that only happens once every year; fireworks show. 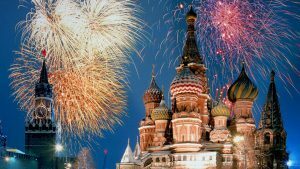 Everyone who enjoys New Year in Moscow will definitely have pictures of fireworks in the Red Square and it’s something that is very unique. Also, because winter in Russia is very beautiful and white, places like parks, streets, landmarks and lakes are blanketed with snow, every corner of the city become very photogenic . Christmas Village in the Revolution Square is the best place to hunt for local and traditional goods like crafts, clothings, handmade snow shoes, the famous Matryoshka dolls, and many more. Travelers, visitors, and tourists always pack this local markets to buy souvenirs from. It’s like the best time of the year to easily get all you look for in a single place. This is another trademark from Russian Winter Festival. Ice is everywhere around Moscow near the time of New Year. You can enjoy winter sports on the ice like skating and hockey, admire magnificent ice sculptures in the parks, or watch international ice shows. Make sure to check the schedule, though, so you won’t miss them or if you have to book for the tickets a few months before the date because it will surely be packed in Moscow during the New Year. All of the things above show how magical, festive, and merry the New Year in Moscow, Russia is. It’s even more festive than Christmas. So now you know why Russian Winter Festival is the best way to have memorable New Year events. If you ever have the chance to, make time to experience this one-in-a-lifetime wonderland.